A day at the races was popular entertainment in the Art Deco period, part of the spectacle of seeing and being seen that was a hallmark of modernity. Then as now, women’s fashion was central to this spectacle. Each of the photos below of women’s ‘fashions on the field’ was taken in Brisbane between 1932 and 1934, mainly at the Eagle Farm racetrack in Ascot. By the 1930s radio had brought racing directly into people’s homes, shoring up its popularity. At the beginning of the decade, only two racecourses operated in Brisbane, both non-profit entities – Eagle Farm and Albion Park. A third, Doomben, was added in 1933. This represented quite a change from the 1920s when there had been a proliferation of unregistered, privately-owned tracks that predominately ran pony races and existed for the sole purpose of gambling. A Royal Commission into Brisbane and Ipswich racing clubs in 1929 led to government closure of these unregistered tracks. In support of this position, it was argued thoroughbred racing at the non-proprietary clubs served a more noble purpose of breeding strong animals for the pastoral and defence industries. In his book on popular culture in Australia, Richard Waterhouse (1995) suggests morality concerns were also in the background driving these changes. The abolition of proprietary clubs reduced the emphasis on gambling. In contrast, races organised by the remaining principal clubs were also social occasions, as much about dining, meeting friends, listening to music and promenading. People still gambled of course, and a quick scour of contemporaneous newspapers in Queensland shows religious leaders and those in the temperance movement continued to denounce the social evils of gambling, in particular the corrupting effects on women. It is interesting to look at the photos which follow in this context, as they all represent a seeming trend at the races to show women looking at the form guide. Admittedly this was one way to quickly contextualise a photograph as an image of the races, but perhaps also served as a symbol of the modern woman flouting tradition. The photos are equally of interest as an illustration of changing fashions in the 1930s. Gone were the days of the androgynous, free-form, drop-waisted Flapper dress, and in its place were longer hems, accentuated waistlines and the figure-hugging bias cut. This change came about with the Depression and a retreat to more conservative representations of femininity. Nonetheless, some influences from the 1920s endured, seen in the bobbed haircuts sported by many of the women in these photos and, importantly for the races, adaptations of the close-fitting cloche hat. 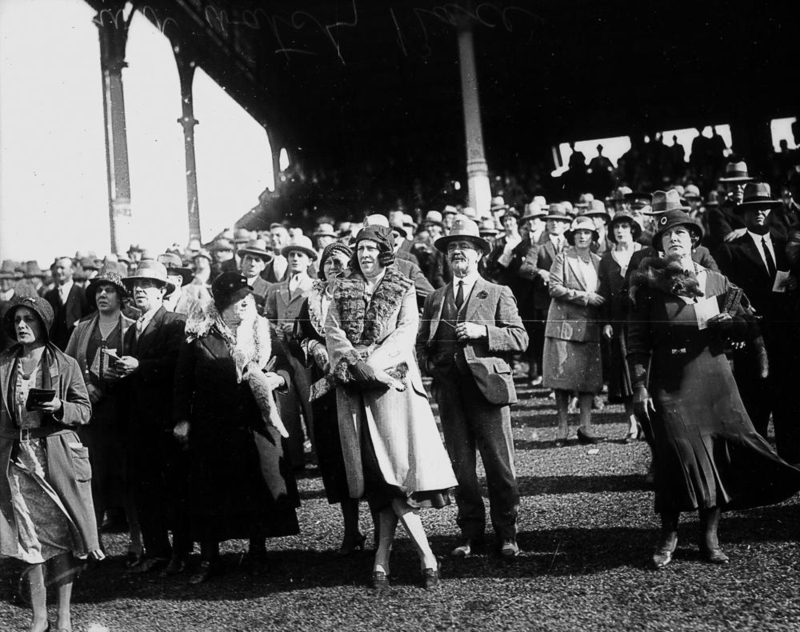 Crowd attending the races at Brisbane, 1932. Courtesy of State Library of Queensland. Gallery: (L) Queensland Pianist Audrey Anderson studies the form guide at Ascot races Brisbane, August 1933; (C) and (R) Vivienne Adams studying the form guide at Ascot races Brisbane, December 1933. Courtesy of State Library of Queensland. 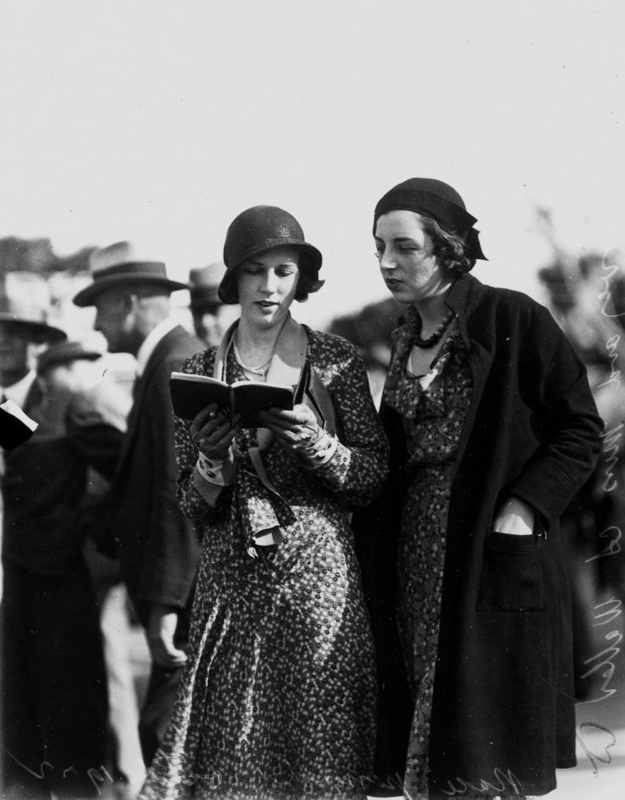 Miss C. Griffin and Miss N. Beasley studying the form guide at the Brisbane races, 1934. Courtesy of State Library of Queensland. 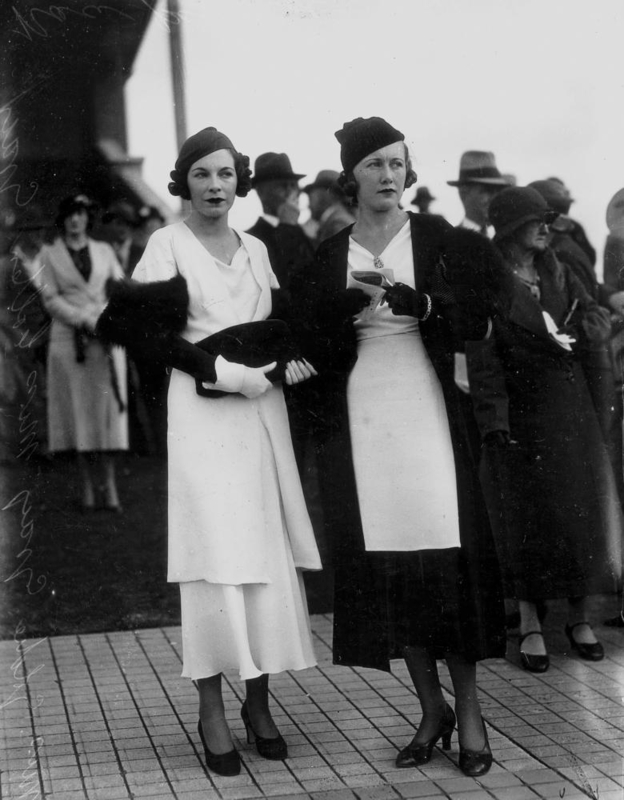 Colleen and Goldie Gray at the Ascot races Brisbane, August 1933. Courtesy of State Library of Queensland. 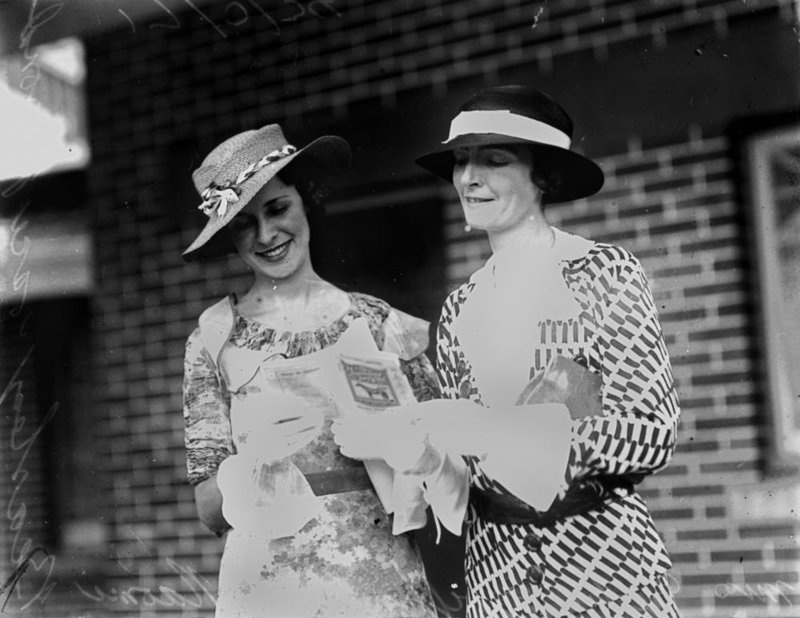 Mrs R. Hervey and Miss A. Waller picking a winner at Albion Park races Brisbane, October 1932. Courtesy of State Library of Queensland. Gallery: (L) Three women studying the form guide at Ascot races Brisbane, 2 December 1933; (R) Miss M. Kearney, Miss Rene Gillon and Mrs Jack Healy at Ascot races Brisbane, October 1932. Courtesy of State Library of Queensland. Australian Institute for Gambling Research, University of Western Sydney. Australian Gambling Comparative History and Analysis: Project Report. Prepared for Victorian Casino and Gaming Authority, Melbourne, 1999. Di Trocchio, Paola and Susan Van Wyck. Art Deco Fashion. National Gallery of Victoria, Melbourne, 2013. Waterhouse, Richard. Private Pleasures, Public Leisure: A History of Australian Popular Culture Since 1788. Longman Australia, Sydney, 1995.